Flash floods that tore through several towns in southwest France following an overnight storm killed at least 12 people, authorities said Monday. Some residents had to be helicoptered from rooftops as the equivalent of several months of rain poured down in a few hours and turned waterways into raging torrents. Initially, the French Interior Ministry reported 13 deaths from the floods in the Aude region. French officials lowered the number to 10 later, saying some victims had been counted twice. The Interior Ministry and Aude officials put it at 12 after two more bodies were recovered in the towns of Trebes and Carcassonne. At least six of the deaths happened in Trebes, Mayor Eric Menassi said. Eight people were injured throughout the affected region and one person was missing as of late Monday. The River Aude that flows through towns such as Carcassonne and Trebes was among the waterways that overflowed from the exceptional rainfall, and the flooding was the region's worst in more than a century, the French agency that monitors flood risks said. In the town of Villegailhenc, resident Ines Siguet said floodwaters rose so quickly after the rains swept in from the Mediterranean that residents fled to rooftops. Siguet, 17, posted video of a ripped-up road where a bridge used to stand. "There's nothing left. There's just a hole," the teenager, whose school was closed amid the destruction, told The Associated Press. "It was very violent." Residents described violent walls of water that crashed through doors and quickly inundated homes. A Villegailhenc resident described for French news channel BFMTV how little time there was to escape. "It was raining, raining, raining and my wife says to me, 'We can hear water, switch on the light.' So I switch on the light and nothing, it's pitch black. So, what do I do? I get up and my feet are in water. I go to the kitchen, I open the door. Impossible. I am trying hard and then the water rose up to my belly," the resident, who was identified only as Jean-Marc, told the broadcaster. "We took what we could and went to the attic. So I had to take the ladder that was behind the house and had water up to my torso. I was terribly afraid." 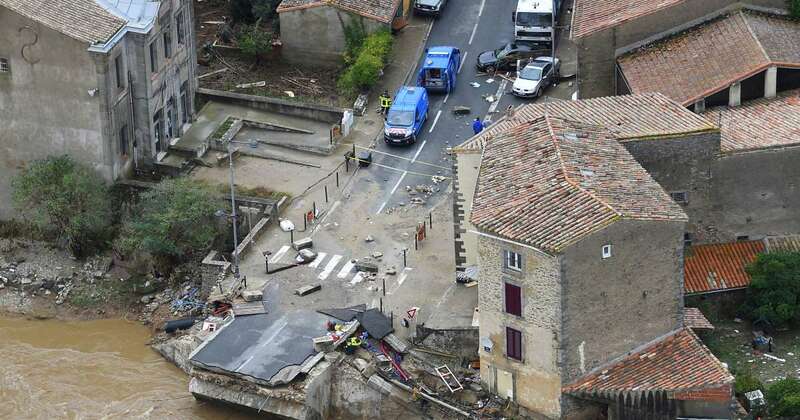 Some of the dead appeared to have been swept away by floodwaters, Aude prefect Alain Thirion said. In the town of Conques-sur-Orbiel, the river rose by more than six meters (20 feet), and floodwaters were in some cases too powerful for emergency services to get through, even on boats, he said. Vigicrues, the French agency that monitors rivers for flood risks, said water levels in the Aude region were higher than at any time since 1891. Television images showed water coursing through towns and villages, stranding cars and piling them on top of each other like children's toys. The French government rushed hundreds of rescue workers to the flood zone and helicopters buzzed overhead. French President Emmanuel Macron planned to visit the flooded region "as soon as possible," but a date wasn't set to avoid disturbing the emergency response work, a government official said. The official asked for anonymity because he was not authorized to speak publicly. An anticipated reshuffling of government ministers would not be announced while the government was focused on the flooding, the official said. AP writers Sylvie Corbet and Samuel Petrequin in Paris contributed.